It’s April and there is a fresh six inches of snow on the ground here in MN. Rumor has it, another five are coming this weekend. There are a lot of things I love about this state, but third winter isn’t one of them. When the earth clings to her wintery blanket, and the air still has a bite to it long into the months that promise warmth, we must find ways to soothe ourselves. Yesterday some dear friends came over for comfort food and rich coffee, and we documented our recipe explorations. It’s the little things that help you through and I wanted to share this classic lunch item with a small breakfast twist hoping it will bring a small bit of pleasure. Most items you will find in your pantry, so you don’t even need to go out before the snow comes. Go ahead and indulge yourself in some Peanut Butter and Jelly Stuffed French Toast. I used up the end of the jam made from last summer’s berries trying in every way to connect to the freshness we seem to waiting eternally for. 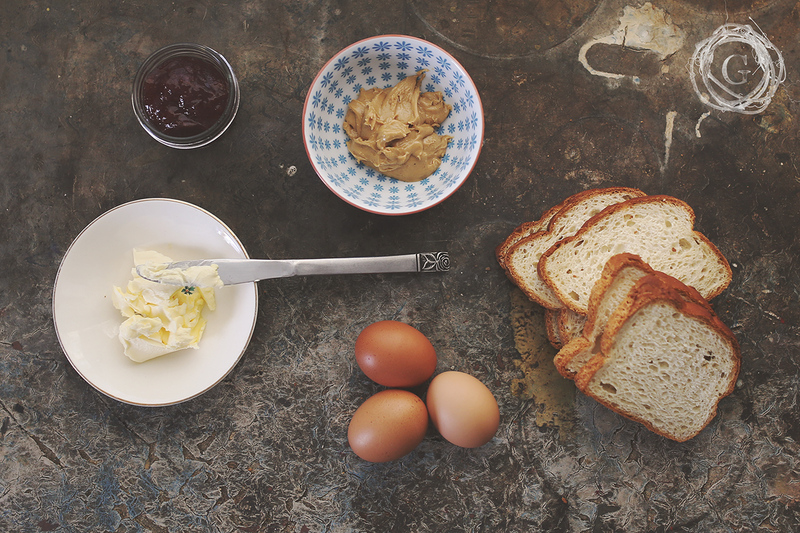 I also chose a sturdy bread full of grains and oats to keep a stronger structure to the french toast creation. The beauty in this recipe is you can scour your cupboards for any different and interesting twist to add to the joy of eating this filling and heavenly meal. Here at Gatherhaus we prepare meals with foundation cooking. That means we provide the basic recipe (with some delish bonus idea ingredients) leaving the creating of the actual meal up to you. This recipe can be made gluten, dairy, sugar, nut, soy and grain free. Crack all eggs in a bowl, add milk then cinnamon if desired. Whip all ingredients with a fork till fully incorporated. Set aside till sandwiches are ready to be dipped. While preparing our brunch, we experimented with three different ways to cook our Stuffed French Toast. 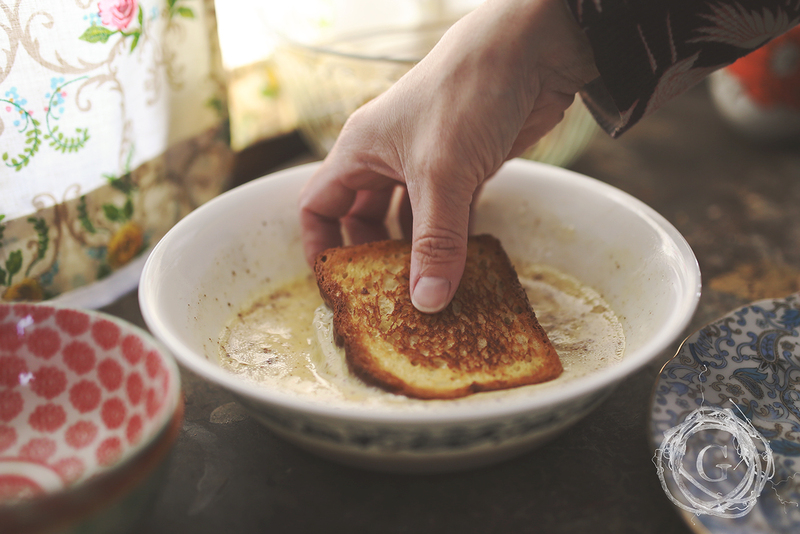 Once bread is toasted, spread butter over two sides as if making grilled cheese. 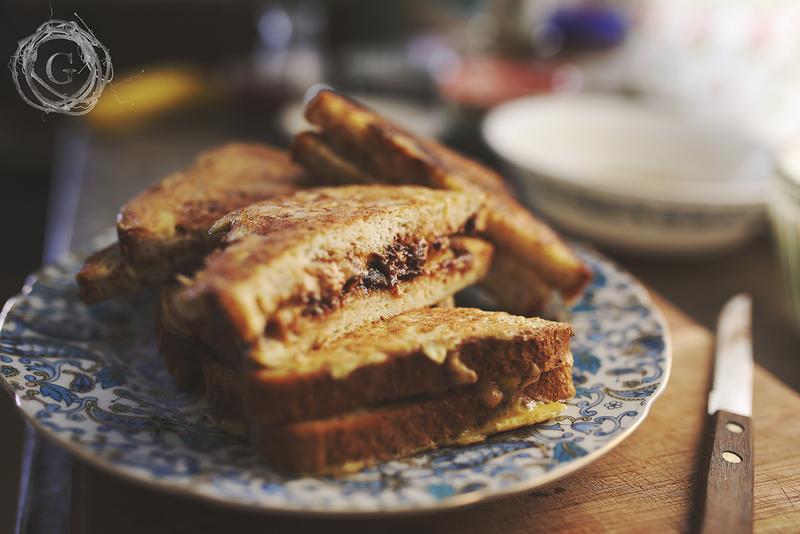 Flip toast over, spread Peanut Butter and any other chosen filling ingredient. Grill butter side down till golden brown. Once done on both sides, dip in whipped egg mixture covering both sides then put back on grill in classic French Toast form. Cook 2-4 min on both sides till golden brown. This method provided a harder crust/bread texture. It was not as soft as traditional French toast. Butter two sides of bread as if making grilled cheese. 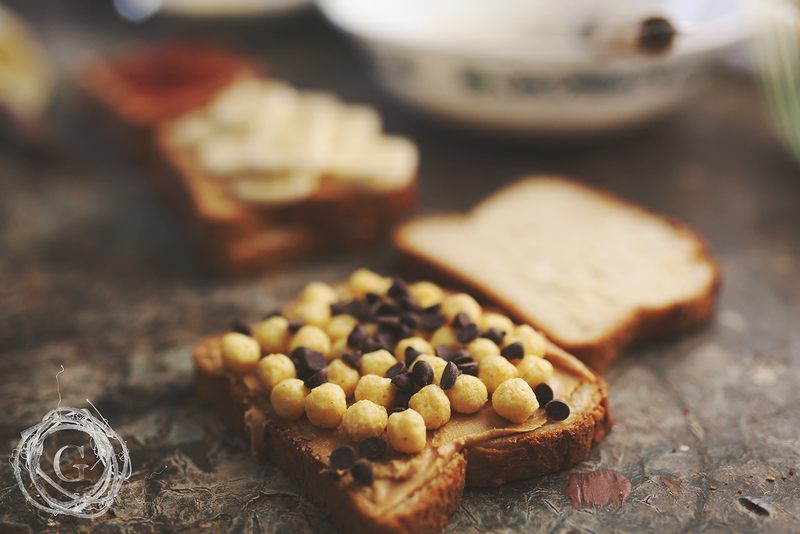 Flip toast over, spread with Peanut Butter and any other chosen filling ingredient. Grill sandwich butter side down till golden brown. Once done on both sides, dip in whipped egg mixture covering both sides then put back on grill in classic French Toast form. Cook 2-4 min on both sides till golden brown. This method didn’t provide much of a difference in texture or taste, simply just added more work. It can be left out. Spread chosen filling ingredients on two sides of bread. Place on top of each other, then dip into the whipped egg mixture. Place on grill pan and cook 2-4 min on both sides till gold brown. 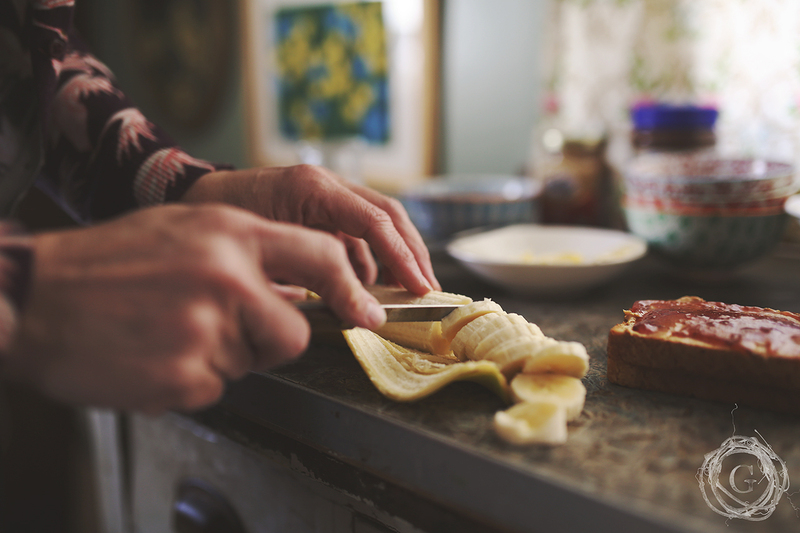 This method gave you a classic soft French Toast taste with a bit of crunch depending on your filings. This was my prefered method, while my friends prefered Method #1. Top your Stuffed French Toast with classic Maple Syrup, Berry compote, or Maple butter. Filling you favorite mug with a fresh brewed cup of coffee or tea goes without saying in my house. Add bacon or scrambled eggs to round out your brunch, but the French toast is so filling you really won’t need it. Remember to cook together, eat together, and enjoy together. Stay warm out there fellow midwesterners, they say spring is coming, but this will make the wait a little easier to swallow.